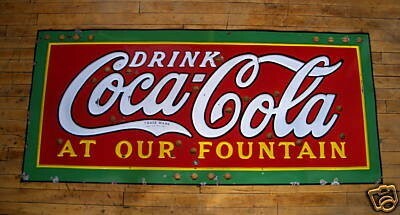 This sign encourages its readers to “Drink Coca Cola At Our Fountain.” The sign is red and green, as are most Coca-Cola signs from this time period. In the center in large letters is the classic Coca Cola logo. The sign appears to be from the late 1930’s, but it is hard to pinpoint an exact date. When viewing this sign with its neons, it is wonderful indeed. The sign measures 40″ by 90″.